…encouraging participation, exploration and personal growth through simple group living in the outdoors. Our half season traditional program provides girls with a forum to experience new challenges, enhance self-confidence, develop skills, and establish enduring friendships in safe, beautiful surroundings. Each Camper at Fernwood Cove brings something special to the atmosphere and cooperative spirit. Our unique gathering of girls and caring, understanding, Staff creates a diverse and supportive community. Our Policies and Procedures are established within the parameters of our mission for two reasons only: Your daughter’s safety & community living. It is the utmost priority of Fernwood Cove to provide your daughter with a physically and emotionally safe overnight Camp experience. If a Camper(s) exhibits behavior (proven or suspected) which puts them or others at physical or emotional risk, Fernwood Cove reserves the right to release the Camper back into the custody of their parents/guardian. Some examples of these behaviors are: Anorexia/bulimia, cutting and bullying. Tuition will not be reimbursed for Campers sent home for unsafe behaviors. Limitless possibilities for the future! All forms can be submitted from your parent account. Enroll your returning Camper or new sibling on Visiting Day Weekend and receive a $400 discount on tuition. Enroll your returning Camper or new sibling within 14 days of Visiting Day and receive a $300 discount on tuition. You are our greatest supporters!! To say thank you, we would like to give something back. For every new camper that enrolls, based on your referral, we will credit your child’s account 10% of the current year’s tuition. The Referral Incentive will be reflected on your Final Invoice. This applies to a referred Campers first year of enrollment only. There is no limit to the number of Campers you can refer. This does not apply if the child referred is an immediate family member, i.e. a sister. If your child ages out of Camp, this incentive still applies! We will simply write you a check for 10% of the current summer’s tuition. As an essential part of our Fernwood Cove community, you know what kind of Campers we are looking for. These are the types of families, and girls, you want your daughters to spend summer after summer with at Fernwood Cove. Fernwood Cove… PLEASE – NOT A SECRET!!! While you want to keep Fernwood Cove a secret, only for your daughter, this only ensures Camps eventual demise. Alternatively, you can refer girls outside of your daughter’s school and age group. If you are concerned about school or home friend dynamics, this is the precise reason we have two distinct sessions. Allow us the opportunity to help you sort through these potential questions or problems, it’s what we’re here for and it is what we are really, really good at! We want the same things for your daughter as you do; safe, fun and life-changing summers at Fernwood Cove. Fernwood Cove is more than an experience, and we want to share it with the world! We provide you with the option to pay your daughter(s) account with a MasterCard, Visa or AMEX. Please note the following procedures when using your credit card. All credit card charges are subject to a 3.25% surcharge, rounded up to the nearest $1.00. Credit Card payments can be made by logging into your Parent Account and selecting “Make a Payment”. 2. AutoPay will then automatically charge your credit card when payment is due for all future payments. For New Camper Families: It is important to fill out the Parental Input form as completely as possible. This is an important guide to placing your daughter successfully with girls that will be compatible with her. Please let us know friends/cousins or any other acquaintances she may have here at Camp. 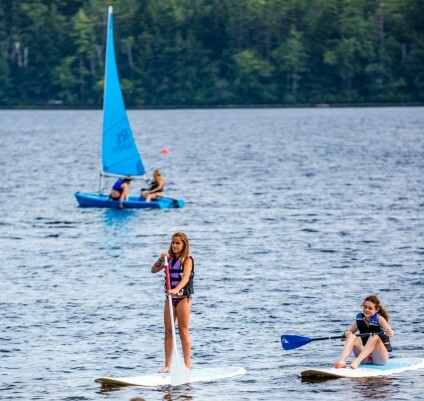 For Returning Camper Families: We encourage positive relationships which enrich not only your daughter’s bunk group, but also the entire Fernwood Cove community. Bunk assignments and bunk groups will be dynamic from summer to summer and bunk request are NOT guaranteed. As with everything at Camp, bunking is something that you as parents, must trust that we are making appropriate decisions with your daughter’s best interest and the best interest of the entire Camp. If your daughter becomes anxious about her pending bunk placement – please remind her that it’s our job to send home happy campers – it’s what we do. Home Friends/School Friends: It is our policy not to bunk home or school friends together. We find that campers are more successful sooner, when they are in a cabin of girls they may not know. This encourages the girls to step outside of their comfort zone and make new friendships. Home friends can take activities together, participate in evening programs, and spend free time together if they choose. There are many opportunities for girls, whether they are home friends or not, to spend time together even if that does not include physically living in the same bunk. Please supply your daughter with all her stationary needs at the beginning of Camp. Your daughter is asked to write home twice a week on Wednesdays and Sundays during rest hour. We encourage our parents to write letters as it is very important Campers receive frequent letters from home throughout the summer. This is especially vital in helping New Campers adjust to Camp. Please avoid writing letters that dwell on home ties or sad topics. Write positively about your daughter’s Camp experiences. The tone of parents’ mail can have an effect on her Camp experience. We have a NO PACKAGE policy. Please do not send your camper(s) packages! In keeping with our philosophy of simple living and after much thoughtful consideration, we do not allow “Camper care packages”. The only packages that we will accept are birthday packages or forgotten uniform, toiletries and letter writing supplies. All packages will be checked and any non-necessity items such as food, candy, gum, toys, jewelry, etc. will be discarded or held in the office for pickup on Visiting Day. Please tell extended family members about this policy as well to avoid disappointment of an undeliverable package. Thank you in advance for your cooperation with this policy as it helps us create a healthy, fun and safe environment for your camper(s). One-way emails are delivered daily. Emails submitted after 7AM will be delivered the following day. Is another family member or friend wanting to send one-way email’s? Great! You will personally be able to give access to those people. You will see an approved senders list, click on the +NEW button and enter their EMAIL ADDRESS and Name. They will receive an email requesting them to create an account that will ONLY give them access to your daughter(s) one-way email. Please note: You may rescind an Approved Sender ability to email your daughter at any time from your Parent Account. Our dedicated Camp Photographer will be photographing the campers, activity periods, special events and trips each session. These photos will be available online after the session has ended. Parents will be emailed details on how to access these photos once the album is complete, please be patient we will be working hard to make the album live as fast as possible. All photos will be available for free download with the option to order prints directly from the site. Fernwood Cove’s Parent Newsletter is the Moxie Minute. Monthly e-newsletters are sent via email to all Fernwood Cove parents. Important updates and reminders, as well as information about upcoming events, deadlines and the Fernwood Cove Blog are included. Additional updates and reminders are sent from directors throughout the off-season as well. Make sure you have saved the individual email addresses of the Fernwood Cove administrative team in your contacts to ensure you receive all email communications throughout the year. Follow Fernwood Cove on Twitter and get regular updates as well as access to a variety of resources related to camp, the camp experience, parenting, and so much more. A monthly blog is posted providing in-depth insight into various aspects of camp. Blog posts are typically written by camp administration, but we invite members to the camp community to contribute as well. Our monthly Moxie Minute, the Fernwood Cove Parent Newsletter, will highlight each month’s blog post and provide a link to the blog. The Fernwood Cove Blog is updated regularly throughout the summer as well. Blog posts are written by staff members and provide insight into the activities and events of the day. The Fernwood Cove Facebook Page is the perfect place to connect and receive more in-depth information about upcoming events, off-season updates, reminders, and additional resources to help prepare for the summer. You can also tag “Fernwood Cove – Extraordinary Summers for Girls” in photos that you post to Facebook and share Fernwood Cove memories with the camp community. This is perfect for off-season reunions, enrollment announcements, and photos from the summer- we love seeing updates from the Fernwood Cove community! Instagram is a great way to connect with members of the camp community and re-connect with your memories of camp. While this is the most popular social media platform for campers, CITs, and alumni, it’s also a great way for parents to receive fun and quick updates. Remember to tag @FernwoodCove in your personal posts as well! To simplify the process and eliminate lost duffels shipped via common carrier, we have partnered with Camp Trucking which provides duffel delivery service from your door to your daughter’s bunk and from bunk, back to your door. This service will add convenience as well as save you time and money. Please find the Camp Trucking literature in the front pocket of this book. Camp Trucking now services the entire United States. If you still wish to use a common carrier, both UPS and FedEx make daily deliveries to Camp. Please DO NOT SEND TRUNKS, as we have no place to store them, therefore; we ask that you pack in soft duffel bags or other collapsible luggage. If you plan to lock your daughter’s duffel with a combination or key lock, please send the combination or a spare set of keys (labeled with your daughter’s name) to the Camp Office – just in case. At the end of the season, all Campers who fly home or take the bus, will have their baggage shipped home. All luggage will be sent home via UPS or FedEx unless YOU have arranged round trip Camp Trucking shipping – Fernwood Cove will bill you directly. It is VERY IMPORTANT that your daughter’s luggage have a shipping tag affixed before they depart camp. Your daughter’s baggage must be shipped directly to Camp. She may bring one (1) small carry on with her on the plane. Our transportation to Camp considers the number of seats needed for Campers only – we do not have space for large duffels or other checked luggage. You are most welcome to bring you daughter’s bags with you to Camp and drop them off at her bunk. She will unpack with her bunk mates at a later time. Spaghetti strap tops (<1 inch in width) or clothes exposing the midriff are not permitted at Camp or outside of Camp during your daughter’s Camp stay. Please do not bring or send this item to Camp. The following policy should guide packing for Camp. Tevas/Crocks: (with a heel strap) may be worn throughout the day. Sneakers: are to be worn during all sporting activities, including team sports and active evening programs. Closed Toed Shoes: must be worn in the following areas: horse barn, sewing/fabric arts and at campfire. “Gladiator Sandals” and similar sandals with non-supportive straps are only allowed during Services and Banquet. Wedges or High-Heeled Shoes: are not permitted at camp. Flip-Flops and Slides may be worn to the shower house ONLY. Please do not send your daughter to Camp with expensive jewelry. Simple studs for pierced ears are fine. Dangling jewelry will not be permitted in most activities as it can be dangerous. Electronic devices such as cell phones, E-Readers, Tablets, Video Games , or other gadgets that have internet access, are not allowed at Camp (this includes, but is not limited to, IPods and other MP3 Players with video playing capabilities, IPods, Kindles, etc.. These items detract from our mission while at camp. If such items are found they will be held in the office and returned at the end of camp. Music players with headphones or small speakers are okay for bunk use and van rides only. You can buy 2nd Generation iPod for less than $50 by clicking HERE. Remember there is no access to power outlets to recharge so it is preferable to have battery operated devices. We must insist that Campers do not keep money in the bunk. Camp provides funds your daughter might need for trip days and special events. Please instruct your daughter to turn in any travel money with her plane tickets to the Camp Office for safekeeping. Please remember that it is your daughter’s responsibility to take care of her belongings. Do not send irreplaceable possessions such as jewelry or other expensive items. Fernwood Cove is not responsible for lost, stolen or damaged personal property. All parents are requested to notify the Camp administration of any “late arrival” plans. Camp should be notified as soon as possible if a Camper will be arriving late. No plans should be made which would require a Camper to leave Camp and then return – these sort of hiatuses are very disruptive to the entire Camp community. In the case that a Camper does not arrive at Camp as planned, Camp administration will contact the parents/guardians by phone and/or email and confirm why the Camper has not arrived at Camp. We do not prorate/refund any tuition for late arrival, no-shows or early withdrawal. Smoking, use of alcohol or use of drugs or inhalants in a manner other than that for which they are prescribed is illegal for children of Camp age, and is strictly forbidden at Fernwood Cove. For the safety of all, Fernwood Cove does not allow Campers to have weapons at any time. We have no tolerance for the breaking of the Drug and Alcohol or the Weapons policy. If a Camper chooses to violate these policies while under the care and authority of Fernwood Cove, the Camper’s parents will be notified, and she will be immediately removed from the Camp community and taken to the next available transport home. Fernwood Cove is not responsible for returning any tuition or fees paid for a Camper who is sent home due to violation of these Policies.